Free unlimited access during our opening hours. Your goods are completely safe with us – all our storage facilities have 24hr CCTV, perimeter fencing and Redcare alarm systems. The cost of the insurance premium is dependant on the accurate declared value of the goods coming in to store, our competitive prices are available upon request via telephone or email. Our facility in Norwich offers 24/7 access and has an excellent location just off the A140 on Hall Road, it is easily accessible for people in the Norwich, Wymondham, Attleborough and the surrounding area. All rooms are easily accessible by car and covered by 24hr monitored CCTV surveillance and Redcare alarm systems. 24/7 access available-using secure keyfob and keypad entry systems. Excellent Location â€“ Just off the A140. Long & short term individual storage. Friendly, informative customer advisors on site to answer all your questions. 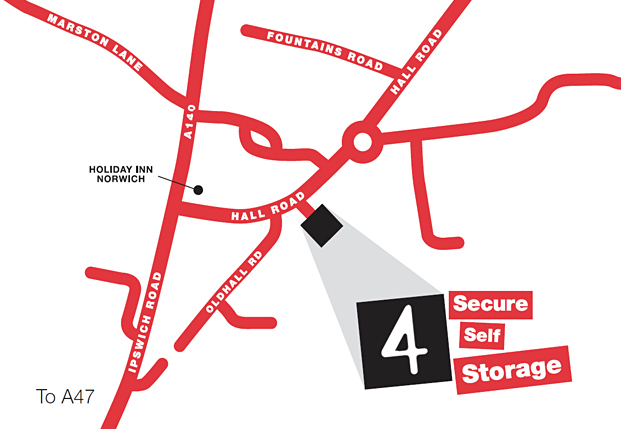 Self storage in East Anglia, our facilities are easily accessible from King's Lynn, Downham Market, Wisbech, Heacham, Hunstanton, Swaffham, Thetford, Watton, Brandon, East Harling,Attleborough, Wymondham and Norwich. "We have used 4 Secure before and have returned to yet again have the great service and value we experienced before, Stacey and her team are wonderful and very helpful, always going that extra mile"
"Julie was lovely, excellent service"
"I didn't know what size room I needed but I was advised and shown a variety of rooms - I opted to try for a smaller room to keep my costs down - I needed the bigger room and changing the room was no problem, a very professionally run company"
"We will not hesitate to recommend the service to anyone, clean, helpful and reasonable prices"
Enter your details & preferred storage location into the boxes above and let us call you back. Find out more details about our promotions. Van Hire available at all our storage facilities, call us for details - another weight off your mind! To keep up to date with special offers and news, follow us today!